It was not an easy journey. The build-up was fraught with funding complexities, challenges and disappointments and the usual anxieties and frustrations of visa rejections. 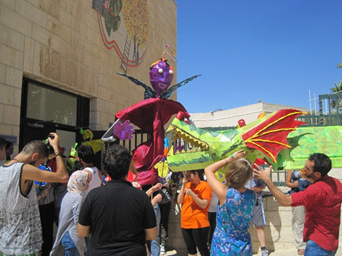 We are very grateful to the British Council in Jerusalem for their invaluable support. A very, very big thank you to all those people, too many to name individually, who responded to our appeal for financial help: your generosity made it possible. It was an intensive and at times exhausting week. The mornings were taken up with a series of four workshops and participants were able to spend a morning in each one. The traditional Dabkeh dance workshop was led by George and Georgette of Al Harah; Ala and his colleagues from Nablus Circus school led the circus skills training; Mirna, supported by Alix and Sharon led the theatre workshop and Tony the puppetry workshops. 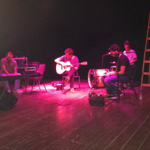 This thread of creative activities culminated in a performance in Manger Square, Bethlehem on the Friday night. For participants this was a deeply symbolic, celebratory and moving event, which attracted a large and engaged audience. Before the show there was an affecting presentation from a Palestinian mother and daughter whose family were on hunger strike in an Israeli jail. The family members were in ‘administrative detention’ and the 15 year old daughter had just been released herself after 3 months in jail for being falsely accused of attacking a soldier. The afternoon was divided into two sessions. 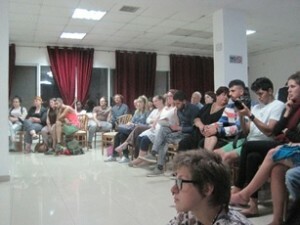 Firstly, there was the Symposium session attended by everyone, which was a series of presentations from directors, artists and academics focusing on their work in the West Bank and beyond. Noora Baker of El-Fanoun popular Dance troupe, which has played a major role in the re-invigorating of traditional Palestinian Dance and Music folklore in the region, was particularly impressive with the passion and clarity with which she described the huge importance of dance and culture as a tool for resistance. Lacey Eninew and Dustin Brass are Canadian First Nations researchers and cultural activists and their account of land confiscation and ongoing racist abuse resonated deeply with the Palestinian audience. Marina Barham, Director of Al Harah, was due to give a presentation on their work in the region. Such was the momentum of the day that Marina put her notes aside and gave a powerful and deeply personal summary of why theatre and the arts are so vitally important to young people in Palestine. Marina gave a moving and insightful account of how specific young people had matured and grown as a consequence of participation in Al Harah’s theatre and arts programme. Marina described how theatre provided a safe space for young people in Palestine, a space in which they could talk freely about their lives and give expression to their deepest anxieties, feelings and aspirations. Besides coping with the outer restrictions of Occupation, in parts of the region young people have to live within the social and cultural restrictions of deeply conservative and traditional communities: their lives abound in contradiction. The second part of the afternoon sessions was given over to a series of excellent and engaging presentations from Indra groups and representatives from Burnley, Derry, Greater Manchester and Plymouth in the UK and from South Africa and Brazil. Alix Harris observed that at a previous Congress her UK group had hidden in their hotel rooms before their presentation: they felt that their experience could not match the pain and conflict expressed in other presentations from Palestine or India and they felt a mixture of unworthiness and guilt. This was a timely reminder of the validity of all our stories and that we had come together to listen, share, collaborate and celebrate. There is no hierarchy in Indra’s Net! Whilst most participants were engaging in various workshops, Tim Prentki led a group who had opted to take part in a reflective exercise, balancing the predominantly practical emphasis with theoretical underpinning. Each morning this group met and discussed the previous afternoon’s presentations, exploring in more depth their significance for the Congress and Indra’s wider progress. Using the Symposium and Indra presentations as reference points, they set themselves the task of devising a theoretical and practical framework for creative work with young people. This framework would also be more widely of service to people, organisations and funding bodies in understanding why working with the arts in settings of conflict, especially with young people, is of such major importance. The evenings were given over to a range of cultural activities. On the Tuesday we had our traditional Cultural Sharing, a light hearted session for which participants are invited to provide a song, dance, story, game or any activity that could amuse, entertain or enthrall their colleagues. On this occasion we had the lot! I will never forget Ala’s dazzling demonstration of diablo or Pete Squire’s inimitable rendering of the story of Reginald the Swallow, which had the audience crying with laughter! 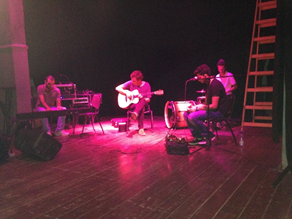 On Wednesday we had a musical evening. The highlight was the collaboration of local band Mafar with guitarist Joff from Wolf Alice to perform a couple of each other’s songs, including a version of the latter’s Turn to Dust in Arabic. On Thursday afternoon we had a visit to the Dead sea and Jericho. After floating around in the salt, sea and health promoting mud– we were there at 4.30 p.m. and the temperature was 47 deg C – we ate falafels, kebabs and chicken in Jericho, the oldest city in the world at 858 metres below sea level! In contrast to the heat of Jericho, the previous day Marina had dragged us from our beds at 5.00 a.m. to walk in the cool of the morning down a beautiful valley to the ancient village of Battir, site of the final battle of the Bar Kochba revolt in 135 CE. In 2011 UNESCO awarded Battir a $15,000 prize for the ‘Safeguarding and Management of Cultural Landscapes’, due to its care of the ancient terraces and irrigation system. Most people in the Western world absorb understanding of the situation in Palestine from the mainstream media. This is predominantly filtered through Israeli media sources. For one week participants in the Congress were able to see the truth of Occupation through Palestinian eyes. In the words of Palestinian Quaker Jean Zaru, ‘Occupation is violence.’ People were able to see with their own eyes the ever encroaching, illegal Israeli settlements built on confiscated Palestinian land, the cramped refugee camps, the hideous wall, again, increasingly built on Palestinian land and the daily humiliation of the ubiquitous military checkpoints. The illegal Occupation of Palestine is a systematic attempt to undermine and destroy a centuries old historical narrative and culture. This shameful travesty of truth and justice is only made possible through the active support of the US in particular, aided by the UK and EU governments. And yet we were also able to experience the warmth, creativity and humour of a wonderful, complex people who despite the humiliations and restrictions within which they live, reached out to us with such generosity and kindness. There is a word in Arabic, sumoud, which means steadfastness, resistance. Marina and our dear friends in Beit Jala are a living demonstration of this patience and courage to persevere against the odds. I would encourage people to explore and support the BDS (Boycott Divestment and Sanctions) Movement which, in the words of founder member Omar Barghouti, ‘is a non-violent human rights movement that seeks freedom, justice and equality for the Palestinian people, based on international law and universal principles of human rights’. Issues and implications arising from this became key points of discussion during the week. All a poet can do today is warn. That is why the true poet must be truthful. In the weeks and months ahead we will be collating and disseminating material from the Congress. We will also begin work on the ambitious proposal to provide a framework for using the arts with young people in settings of conflict. This will be backed up by stories of young people who have engaged with the programme over the years. Seeing at first hand the impact of Occupation is humbling. We ask ourselves that perennial question, ‘what can we do?’ As cultural workers, academics and artists we can bear witness to what we see, we can tell stories for storytelling makes the world stronger. As Jean Zaru said, through stories ‘we resist vague and generalised abstractions and we maintain the urgency and intensity of the concrete.’ We can throw pebbles in the pond of the western mind to disturb and create ripples of truth. We can continue to build a network, a family of friends and supporters around the world who listen, reach out and share. We are pedlars in the art of ‘small changes,’ small changes that can realistically help build a growing momentum of wider awareness.